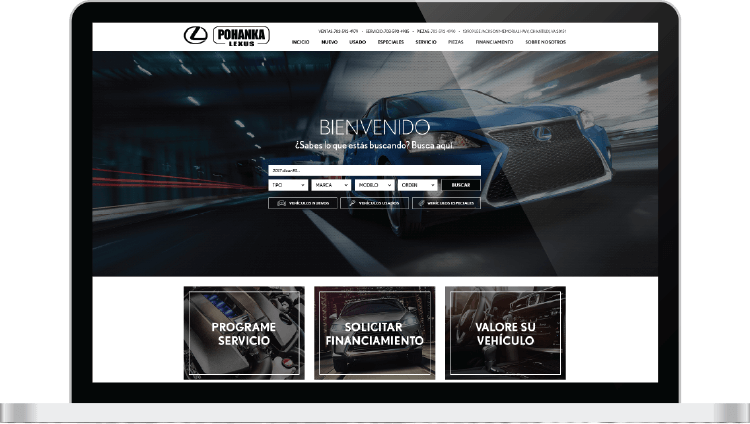 Your website is your dealership’s first impression to all the shoppers in your market, so you better make it a good one. 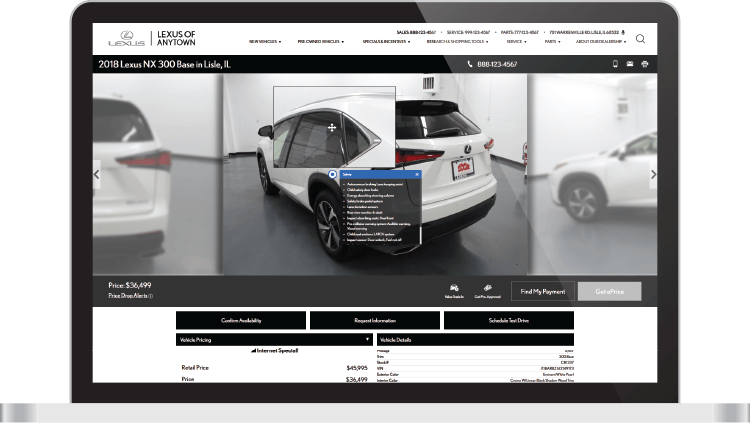 At Dealer eProcess, we create website designs that not only look spectacular, but use data-driven design components that allow us to make the highest converting website platform out there. Our sites are lightning fast, mobile first, and built to convert! Lawmakers have been cracking down on dealership websites that are not compliant with ADA guidelines. The last thing you need to worry about is getting sued for having a website provider that does not build ADA compliant sites. With DEP, you never have to worry about that. All of our sites are scanned monthly and any non-compliant banners, pages, text, etc. 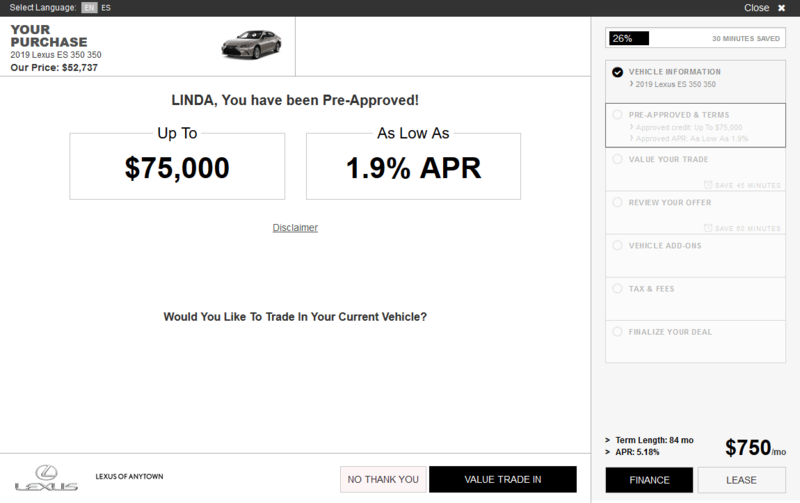 is instantly fixed by our team so that you can focus on selling cars! Google rewards sites that are SSL secure with higher search rankings. Plus, it’s always important to secure your customers’ information on your platform. SSL secure sites keep your customers’ data secure and gives Google a reason to rank your site higher in search! Following the increasing trend of voice-activated technology, Voice Search allows customers to navigate our sites by simply talking. They just need to click the microphone button and say what they want to see. 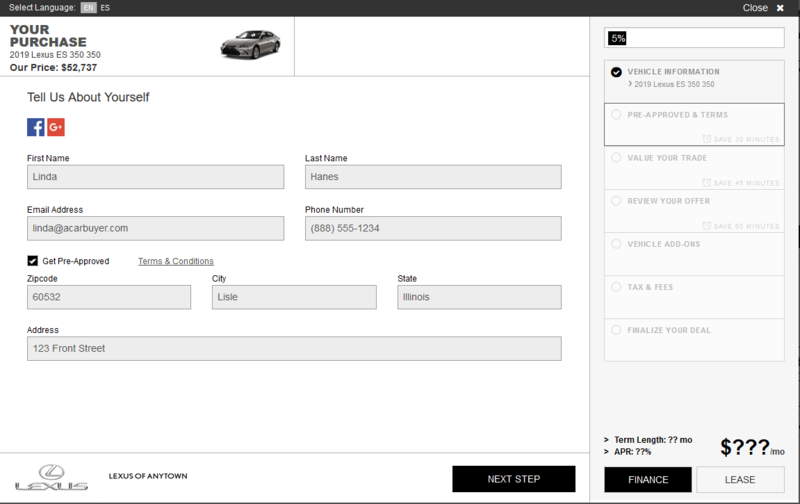 In seconds they can check if the model they’re searching for is in stock and get directions to the dealership! Google has trained the world on how to easily search for anything they’re looking for, and we feel that your website should offer the same familiar experience. 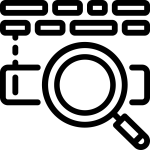 With our real-time site search, customers type in what they’re looking for and the site automatically presents them with any website content that matches their search. With DEP’s Mega Menus, website navigation is quick and easy. 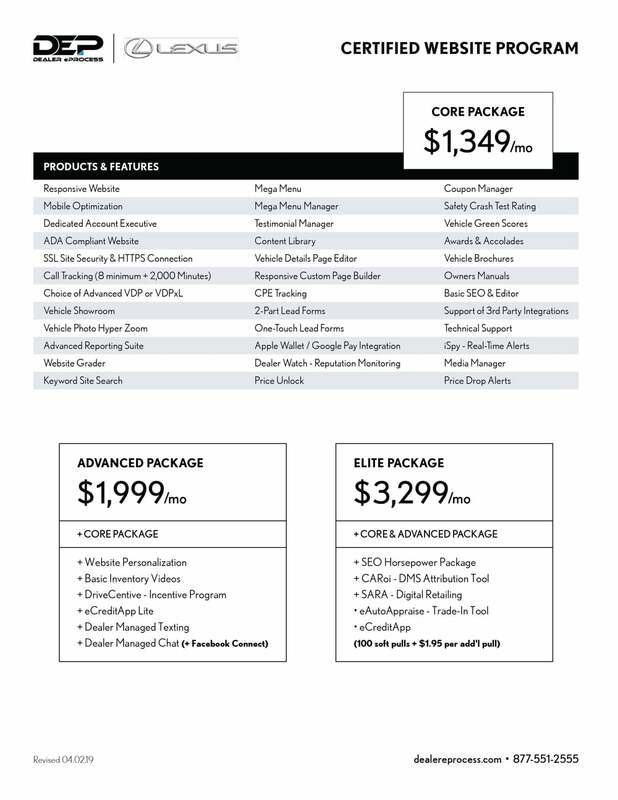 Within this complete menu system, customers can find everything from full inventory listings to parts and service coupons. The customer never has to dig into your site to find the content they’re looking for because our Mega Menus bring it straight to them. Plus, by incorporating more relevant website content into the menu bar, Google gives your site more authority than ever before. Most people open up their smartphone before they even get out of bed in the morning, so it’s crucial for your website to integrate with this technology. Apple and Google integration can send everything from directions to coupons straight to the native apps on your customers’ phones. With today’s shoppers using their mobile devices to shop for cars, the number of pages a customer views on a website is lower. This means your customers are less likely to get past the SRP. Because of this, your SRP has to have as much functionality as possible in order to convert more of your web traffic. This is why we built our SRP to be the most functional and robust in the industry. 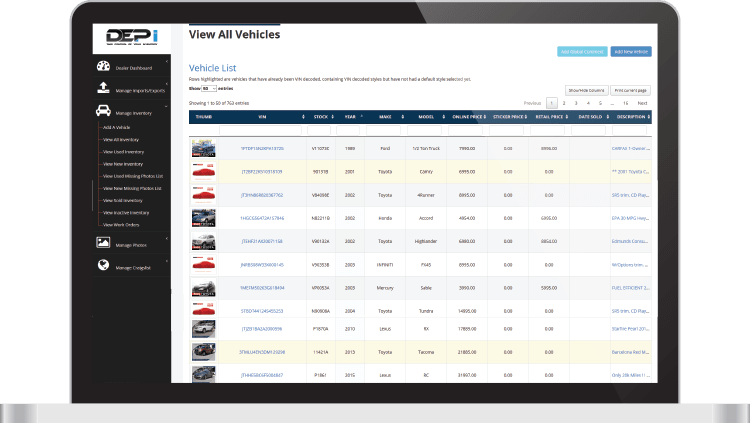 For the customer that wants to take a closer look at a vehicle on your site, we’ve developed the industry’s most complete Vehicle Details Page (VDP). A shopper on the VDP is looking for information beyond the basic “VIN details” of that car. Customers now have the ability to zoom into your hi-res vehicle images for an even more detailed view of the vehicles on your lot. With DEP exclusive Hot Spots, we can layover vehicle info on your photos. 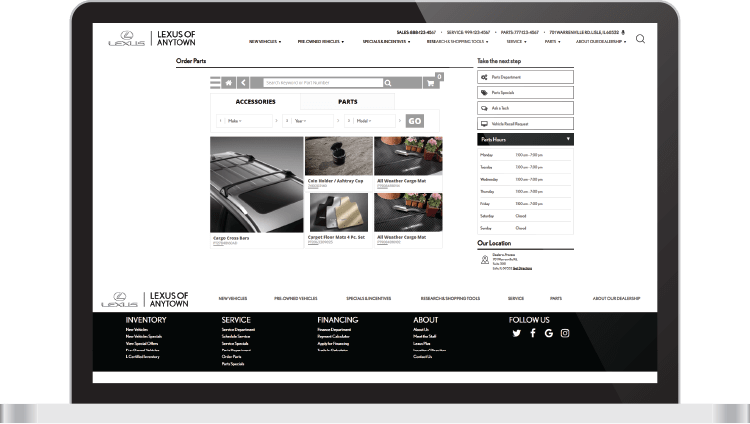 Now, customers can truly experience your inventory directly on your website. Big Data is a very popular term in the automotive industry today. Everyone understands the power of data, but no provider has really done a good job of making that data available, until now. 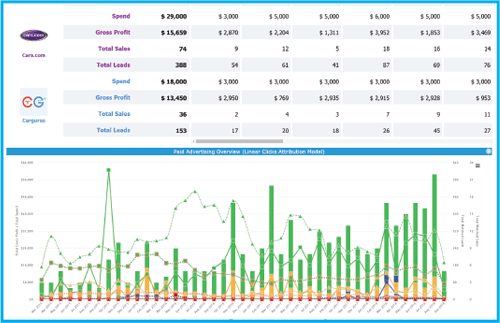 Dealer eProcess is the industry leader when it comes to Big Data and our InSites Dashboard is where the rubber meets the road when it comes to Big Data. InSites gathers data from all different sources: Google Analytcs, Google AdWords, Website Stats, Inventory Data, 3rd Party Conversion Data, and DMS Sales data. 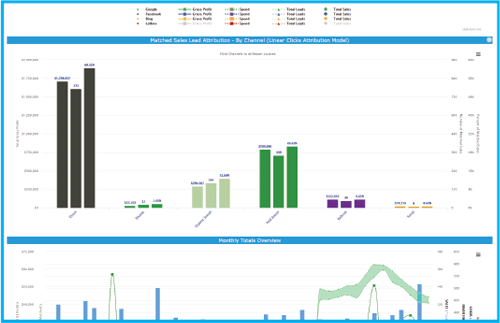 Everything you need to truly understand your business is presented in an easy to understand dashboard; turning Big Data into Actionable Data. 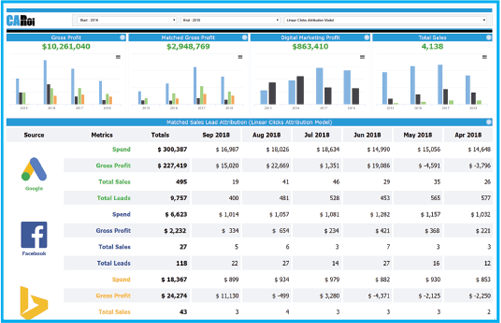 With the InSites Dashboard, you’ll never again have to guess what is and isn’t working for you. Just log in, look at your best performing month(s), and quickly determine your winning formula that sells you the most cars. InSites takes your Big Data and puts it to work! 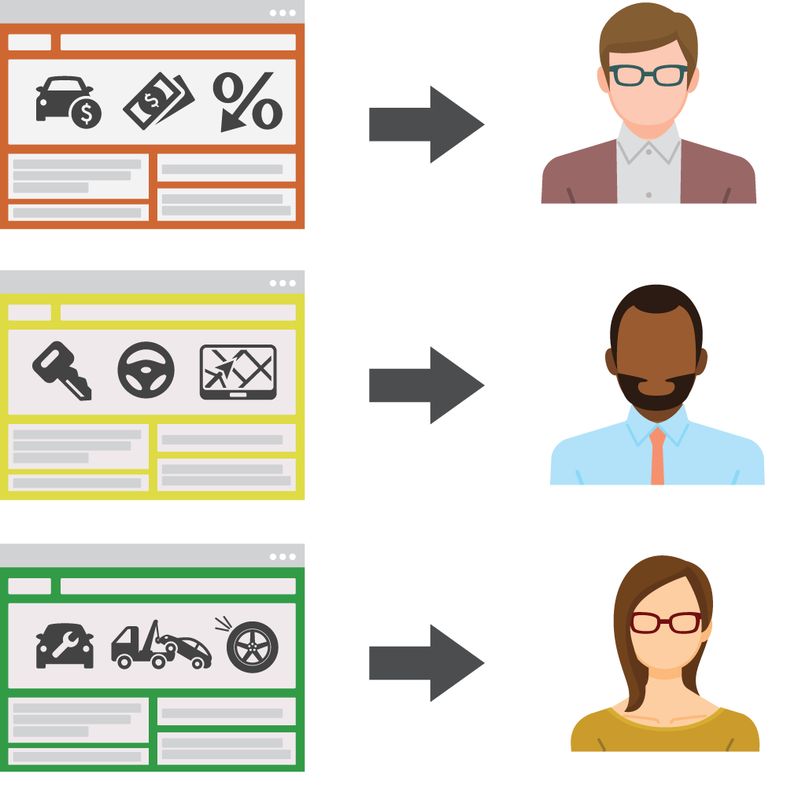 Website personalization is commonplace for all major ecommerce sites out there, so it needs to be a part of your dealership’s website. Customers these days want your site to bring them the content they’re looking for, not the other way around. DEP’s Personalization Engine gives your customers the “Amazon experience” by bringing the most relevant content to every shopper whenever they visit your site. The Smart Search bar prompts each customer to continue researching the vehicles they’ve shown the most interest in. 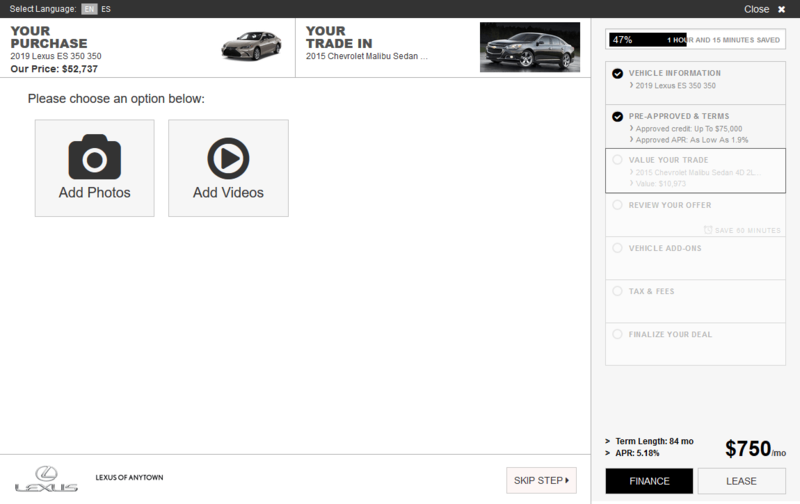 If the visitor recently bought a car from you, homepage content will switch to focus on service offerings. Each customer sees banners custom-tailored their needs and interests. Your homepage becomes a video gallery of all the vehicles the customer is currently viewing, giving them quick access to those vehicles. Your website model scroller gives the customer one-click access to the models they’ve viewed on your site. 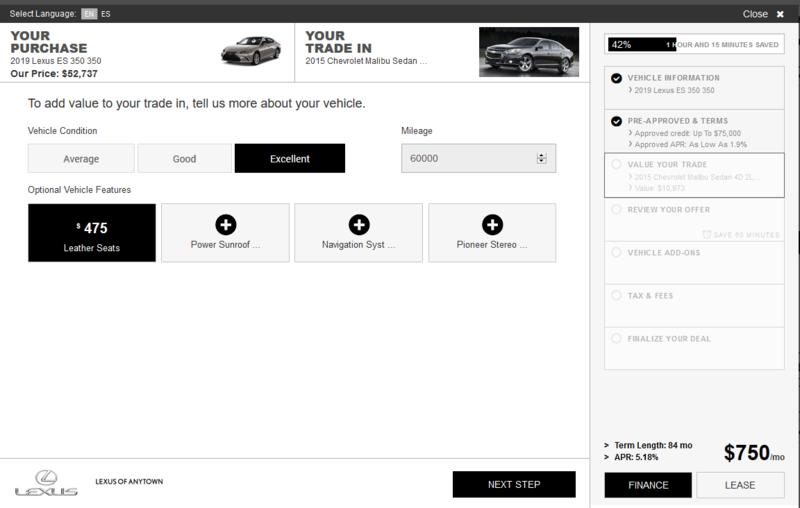 The chat box will show info and prompts regarding specific vehicles the customer has shown interest in. 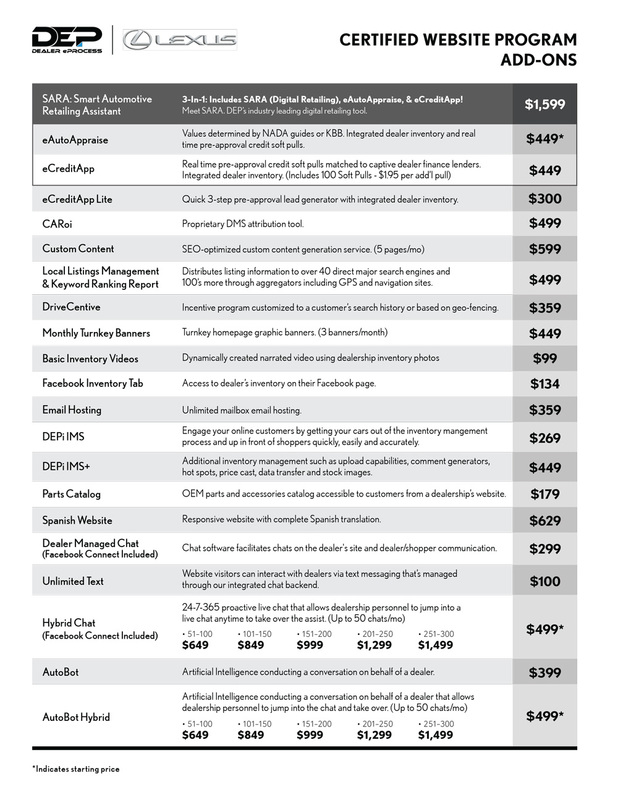 Chat has been a huge piece of website lead generation for years, and it’s not going away any time soon. DEP’s managed chat platform puts you in charge of the conversation with consumers, allowing you to easily manage chats, send links to consumers, and get them to walk into the showroom! Two-way texting allows your customers to initiate an SMS text message directly with your dealership personnel. Efficiently track all messages, improve customer satisfaction, and increase response rates within your dealership. 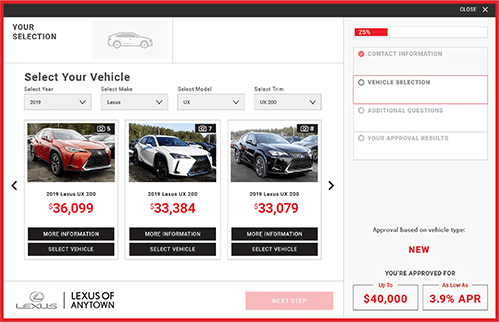 With our logic-based DriveCentive platform, offers can be strategically placed in front of the right customers to give them that final push needed to get them into your showroom. 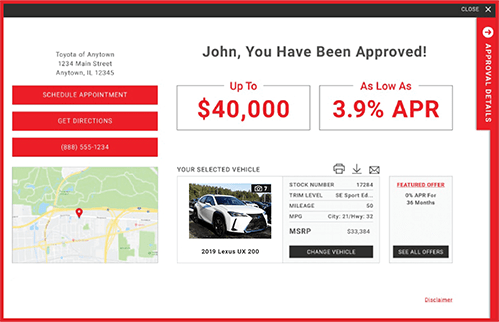 Based on data, such as where a car shopper is located geographically or how many times have they been to the website, a targeted offer will automatically be offered to them. 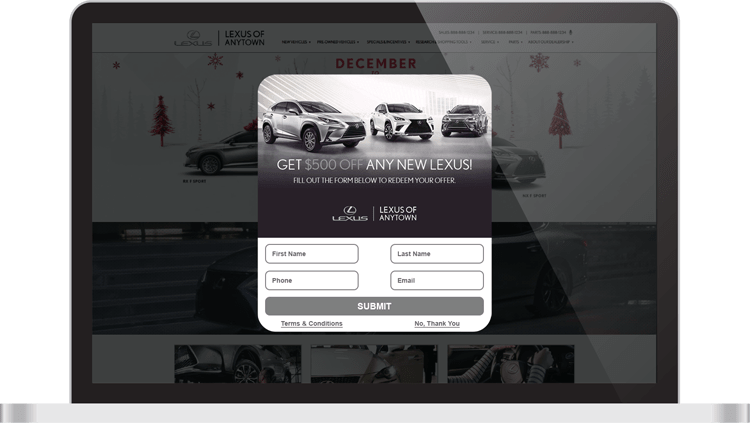 No more waiting for gift card redemptions, simply fill out the personalized offer and the dealer receives a high-quality lead directly to their CRM. According to Google, content is a top ranking factor. Most dealers simply don’t have the time or resources to be adding relevant, original content to their site on a regular basis. We ensure they get customized articles uploaded on their site every month. 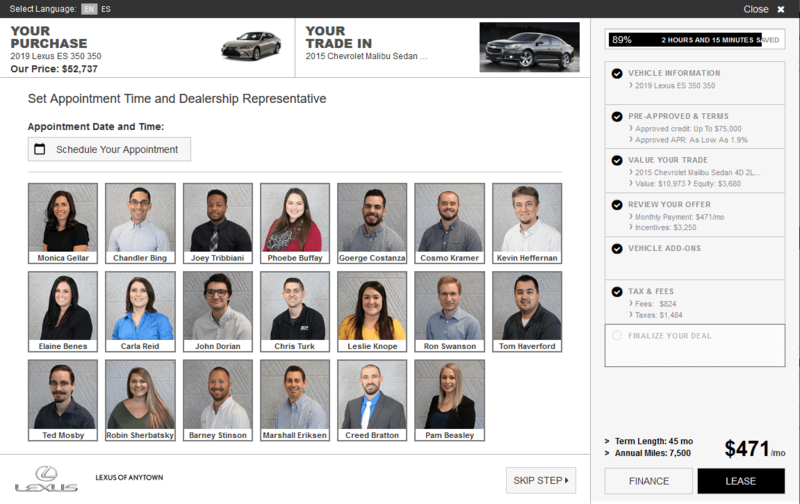 From new vehicle overviews and model comparisons, to service and finance information, we create engaging content that covers all aspects of your dealership! Improving your on-site optimization starts by creating relevant and consistent content. You then need to monitor the performance and impact that content has within search engine results. Identifying that impact starts by tracking your rankings for specific target keywords. Our Keyword Ranking Report includes metrics such as your average position, position fluctuation and top 10 keywords across all major search engines, all locations and all devices. There are hundreds of online directories. Consistency across all of them is necessary to build authority with search engines, which ultimately leads to better rankings. However, monitoring and managing all directories to ensure business info (i.e. name, phone, address, hours, etc.) is consistent and accurate can be difficult and time consuming. Local Listing Management, powered by Dealer Watch, keeps all your online business listings up-to-date for you. Search Engines are taking into account the amount of quality, positive reviews your dealership accumulates. Maintaining your online reputation is necessary not only from an SEO perspective but can significantly impact your revenue stream. 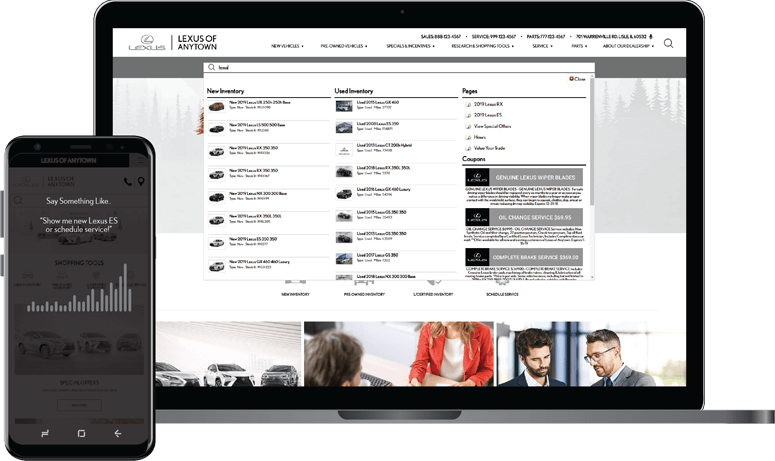 Our Reputation Management platform, powered by Dealer Watch, allows dealers to seamlessly monitor online reviews and social media mentions to ensure a positive brand identity is represented. ‘Used Cars’ is the most searched term for the automotive industry and the most difficult search term to win organically, which is why the top positions are held by large automotive portals thanks to their size and inventory. 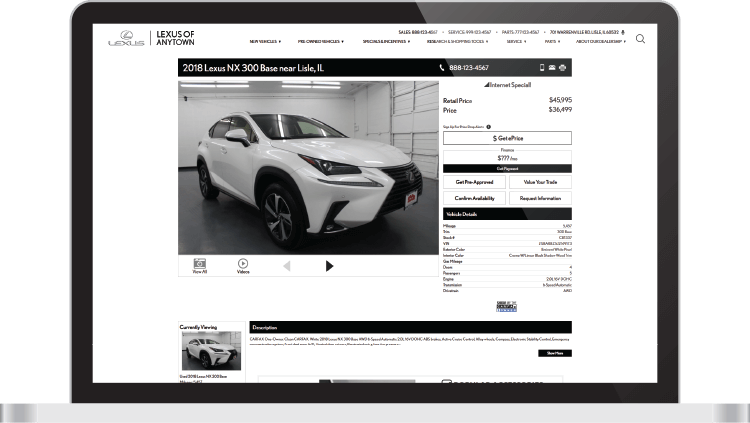 The strategy behind the Used Cars Network is to drive more local traffic to your website coming from ‘used car’ searches and give an additional platform on which to showcase your used car inventory. We pull in all website and digital marketing data and match it to all DMS sales activity, providing a report that shows dealers what IS, and IS NOT helping sell cars. Tying together both online and offline data, 3rd party vendors, and more, we are able to give the exact formula of what produces the best results. 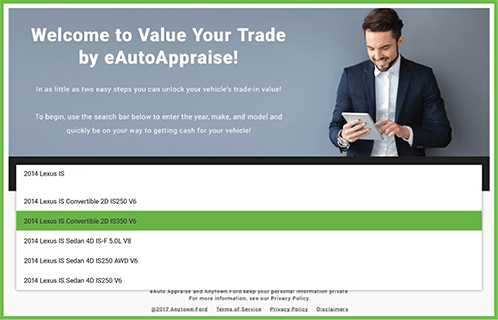 The eAutoAppraise trade-in tool is consistently the top converting lead form on our dealers’ sites, and it’s easy to see why. 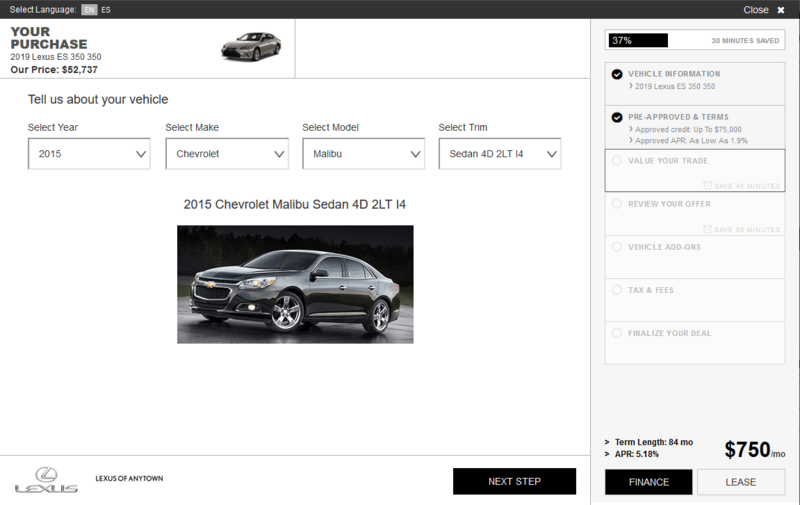 By utilizing the power of Blackbook, KBB, or NADA Guides, you can give consumers an exact valuation for their vehicle in a matter of seconds! Generating high quality, tiered credit leads has never been easier than with the eCreditApp. 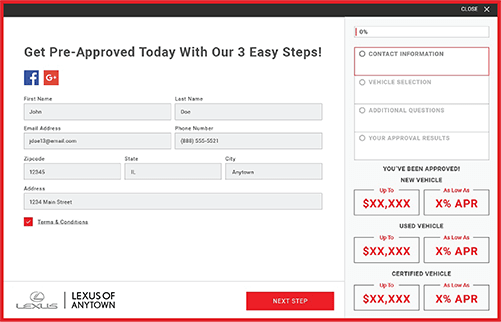 The eCreditApp plugs into any dealer’s website and features a quick 3-step process. It does not require customers to enter their Social Security # or DOB, resulting in max conversion opportunity. Dealers can choose to pre-screen customers in real-time resulting in soft-pull data being delivered to the CRM of their choice. SARA saves customer data from any previously completed lead form and then auto-populates the customer’s contact info as soon as they open the form. This makes things easier and faster for the shopper, and is proven to help increase lead conversion. SARA syncs up with all OEM feeds to make sure that your customers are always given the current rebates and incentives. 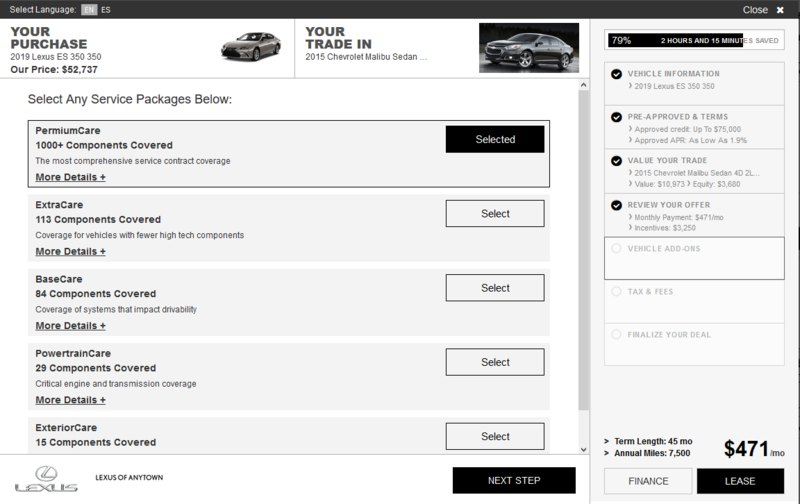 Plus, our user friendly incentive page makes it easy for shoppers to choose the rebates they qualify for. SARA is the only digital retailing tool that connects directly to TransUnion to automatically pull a customer’s credit score and all the auto loans in their name with only the shopper’s name and address. And in real-time! 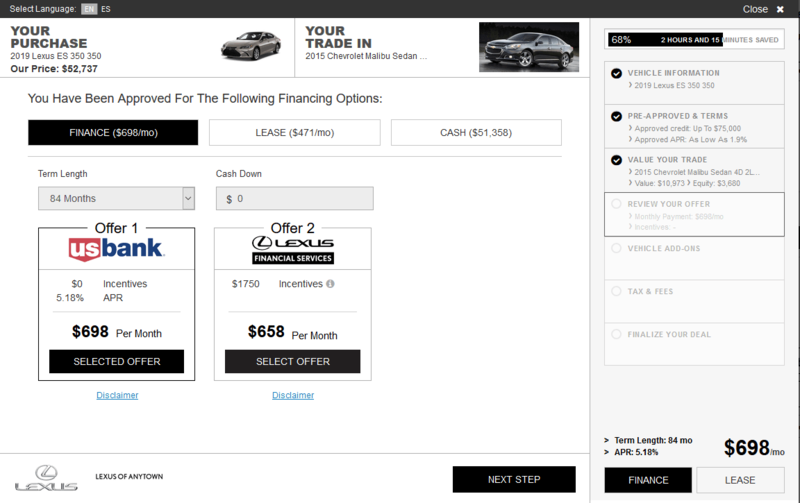 You can’t give an accurate online payment without knowing the customer’s trade-in situation. That’s why SARA includes DEP’s industry-leading trade-in tool, eAutoAppraise. eAutoAppraise can link to either Blackbook, KBB, or NADA Guides so the trade value you give online always matches the value you give in store. 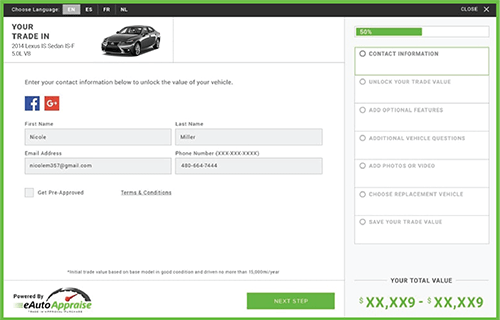 Customers also have the ability to select which options/add-ons they have on their current vehicle in order to get a more accurate assessment of their trade. 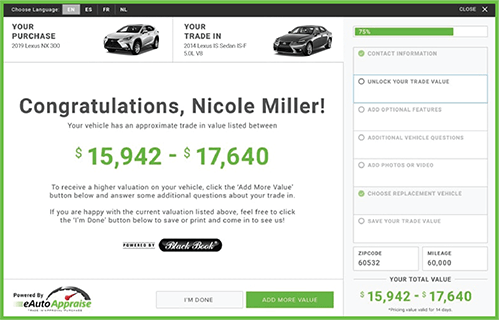 The trade-in portion of SARA aslo has the ability to extract more information from a customer by giving them an option to upload photos or a video of their vehicle. Customers can easily use their smart phone’s camera to capture their vehicle and send you more information about their trade. Another reason why any good digital retailing tool needs to have ability to perform soft-credit pulls is to find out exactly how much a customer owes on their trade-in. SARA is the only tool in the industry that can not only give a trade in value, but also match the customer’s loan to that trade-in vehicle. Since SARA has the customer’s trade-value and the loan data on that vehicle, she displays the customer’s equity position and applys that positive or negative equity to the payments being calculate for the new vehicle. 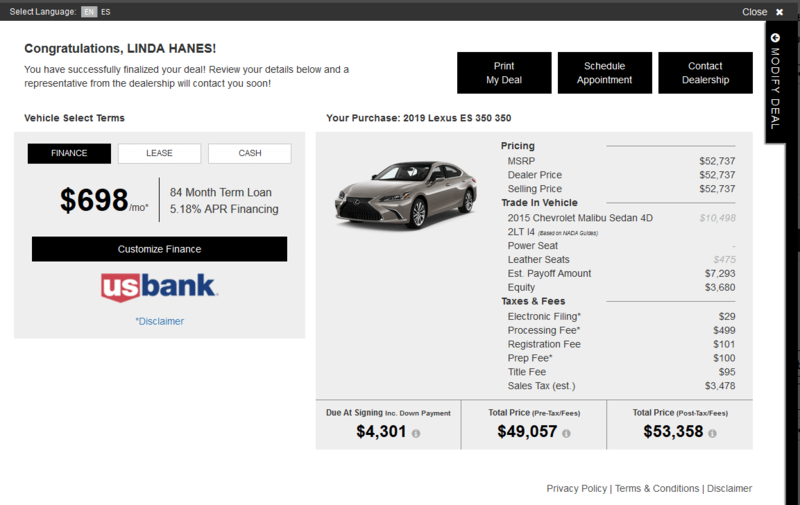 This is a critical part of the car buying process for many consumers, and SARA makes it easy! Once SARA knows the customer’s vehicle of interest, current credit score, trade-in value, and equity position, the next step is to pick the best financing option for this consumer. 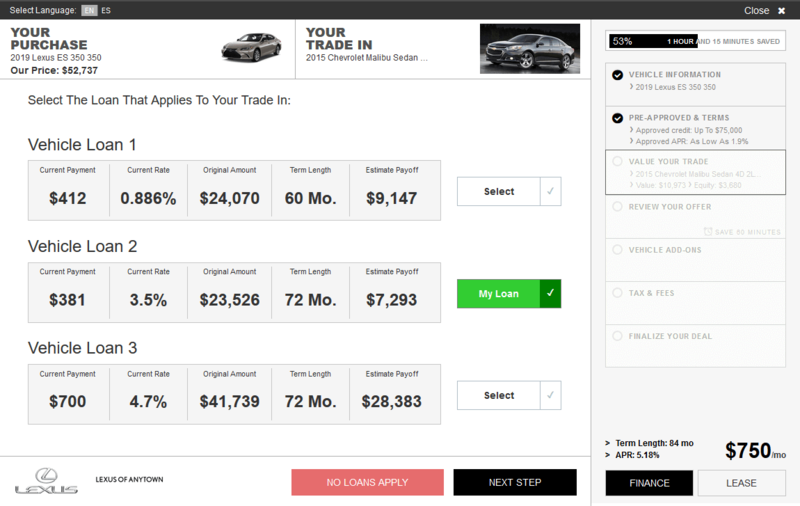 SARA’s proprietary Lender Decisioning Engine gives the consumers a choice of what lender they would like to choose to help them purchase their new vehicle. 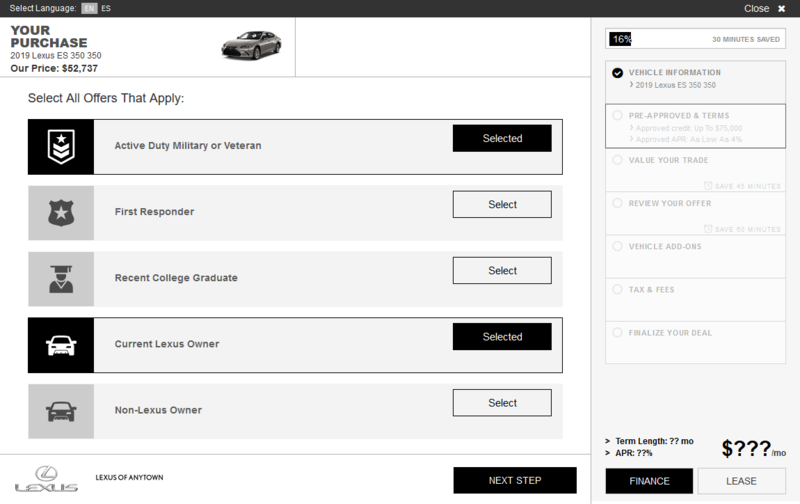 SARA gives consumers the ability to add vehicle accessories right inside the application. 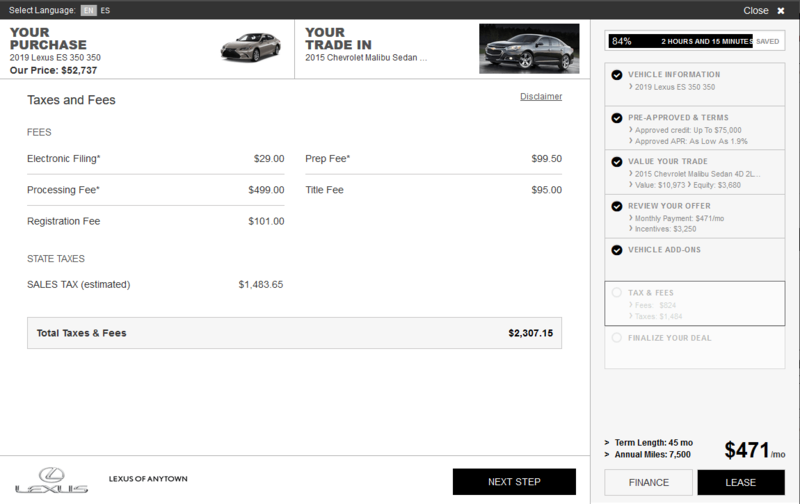 They can view available parts and see how adding anything to their purchase will affect their payment. 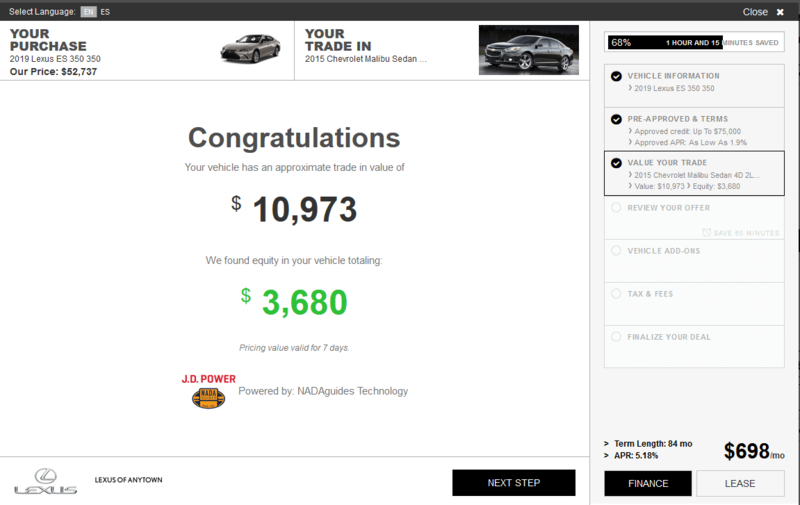 This helps increase the average purchase value for our dealers, which is always a good thing! F&I products are a profit center for any dealership and giving consumers the option to add these products to their vehicle is always going to bring in more revenue to your store. SARA gives you the ability to add custom F&I solutions to the digital retailing process. Presenting accurate taxes and fees to consumers is an inherent part of the car buying process. SARA pulls tax data from across the country and matches the taxes and fees to the consumer’s zip code so that these costs are always accurate. Customers not only want to choose their perfect vehicle, they want to choose their perfect salesperson. SARA displays your entire sales staff and gives consumers the ability to choose who they want to meet in your store and do business with. Once all these steps have been completed, the deal is finalized, sent directly to the consumer via email, and sent directly into your CRM. This way everyone knows the particulars of each and every SARA deal and you can get the consumer into their brand new car quickly and easily! 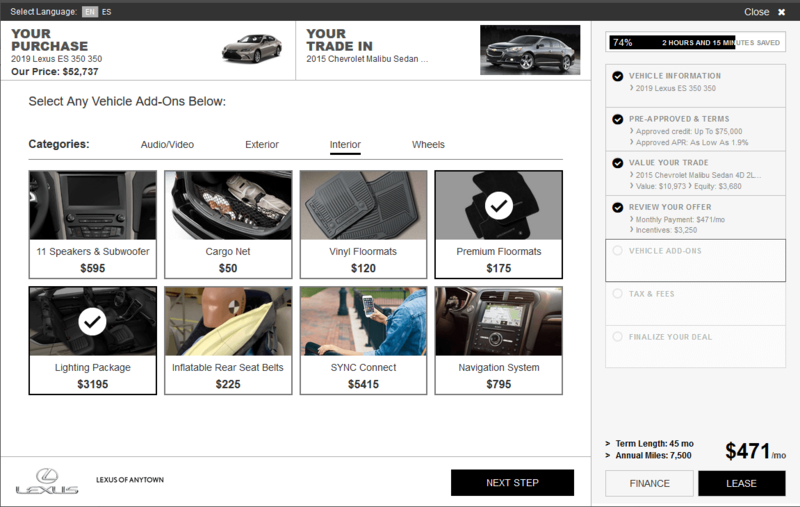 Parts websites have dominated this massive ecommerce segment for years, leaving dealers with nothing but crumbs. Well now the tables have turned. With our online parts catalog, customers can easily shop your parts store. From any device, shoppers can quickly find the parts they need and order them directly on your site. You can now start to gain a bigger piece of the multi-billion dollar OEM parts segment and generate more cash for your store. 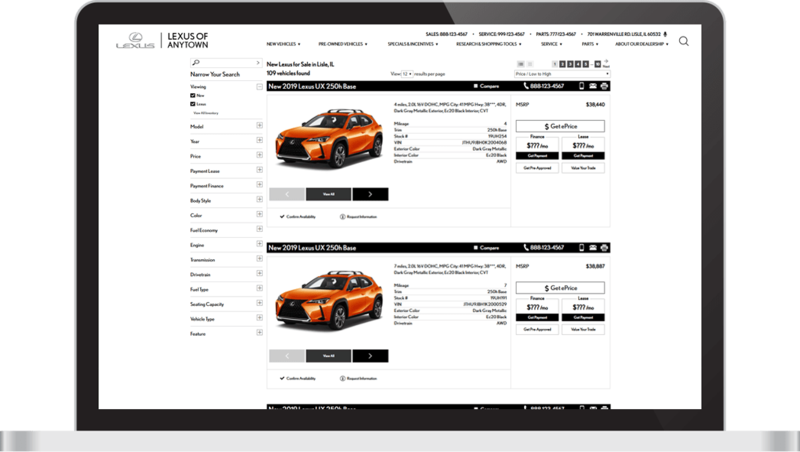 When you choose DEPi for your online dealership management solutions, you get access to sophisticated, state-of-the-art automotive inventory and data management software and services. With multiple packages, services, and tools, DEPi is able to serve a dealer’s individual needs in regard to your data and how hands-on you want to be with it. Our automated and DIY tools are crafted and utilized to save your dealership time and money on vital automotive data and inventory management. The fastest growing group of car buyers in the country is Spanish speaking shoppers. You might think Google Translate has you covered, but you’d be wrong! Translation tools do not work, period. That’s why you need a Spanish language site built from the ground up. Not only do our Spanish sites speak to your Hispanic shoppers in a way that makes sense, but it also helps rank your site higher in Google when search settings are set to Spanish.